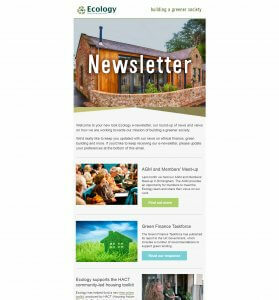 We’ve sent out our latest email newsletter which is packed full of the latest news and topical views from Ecology. The new look format is the first we’ve sent for some time and we’ll be providing regular updates in the future. The May 2018 edition includes a round-up of our recent AGM and Members’ Meet-up, our response to the publication of the Green Finance Taskforce’s report to the Government as well as our sponsorship of the HACT (Housing Action Charitable Trust) toolkit which aims to help local authorities and housing associations support the development of community-led housing in their area. If you’d like to receive the email newsletter please sign-up using the form on our website. We’ve also asked existing recipients to ‘Opt-in’ if they wish to continue receiving it, due to changes in data protection legislation.